The theme of this year’s contest is Freedom. They say the sound of hooves beating the ground defines freedom. Send us your best photos that embody a sense of freedom as inspired by your horse. Three prizes will be awarded in the Open division, and one will be awarded in the Kids’ Only division (for photographers 13 and under). 1. This contest is open only to amateur photographers living in Canada. 2. Multiple entries may be submitted, but only one prize will be awarded per photographer. 3. Photos may be colour or black and white. 4. Photos must be a minimum 300 dpi jpeg, and minimum 4” x 6” in size. If you are unable to determine these requirements, please make sure the file size is more than 500KB. Photos that are too small will not be considered. 5. Photographers 13 and under must include their age on the entry form to be eligible for the kids’ prize. 6. The judge may reclassify entries to other categories to improve the chances of success for the entry. 7. The judge’s decisions are final. 8. All mounted riders in your photos must be practicing safe and responsible horsemanship. 9. Photos must be previously unpublished. 10. Employees of Horse Media Group are ineligible to enter. 11. Prizes may be substituted for others of similar value. 12. 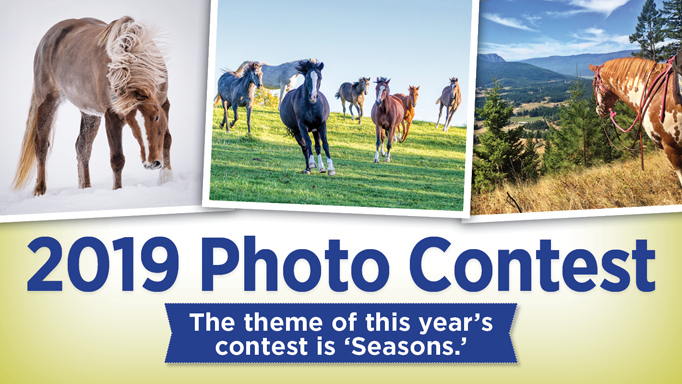 Photo entries must be submitted by the photographer or parent/guardian of a minor. 13. All entries become property of the Horse Media Group. Entry in the contest constitutes permission to use photos in any manner the publisher chooses. Photo credit will be given. The entry form below must be filled out in full for every photo you submit. If you want to mail in a print, click here to download an entry form and mail to: Horse Media Group, P.O. Box 670, 220 Industrial Parkway South, Unit 25, Aurora, ON L4G 3V6. Email info@horse-canada-staging.ccnnzho2-liquidwebsites.com with any questions.